a stone’s throw from Florence. 40 sq.mts - for 2 persons (double bed), self catering, with kitchen & private bathroom, linen and towels provided, independent entrance, small terrace & garden, washing machine, WI FI. (space for travel cot can fit at no extra charge) . 60 sq.mts - for 2 persons (twin beds or double bed), self catering. 1 bedroom, 1 large room equipped with cooking facilities (+ 2 sofa- beds), 1 bathroom, central heating, washing machine, linen and towels provided, private roof-terrace, garden and WI FI. 50 sq.mts. for 2 persons (+2) self catering. Ground floor : entrance, dining room, kitchen and washing machine ; small bathroom w/shower, basin and w.c. ; staircase, 1st floor : double room with arched (hay loft) window, bathroom with shower, bidet, two basins and w.c. Linen and towels provided,WI FI. Terraced garden (35sqmts) with Mediterranean herbs & bushes + bbq and hammock. per week from € 280 to € 480.
per week from € 350 to € 580.
per week from € 350 to € 615. **A supplement per night per person of € 5 for 3rd and 4th persons to be added to rental rates, or € 30 per person, for weekly bookings. In cold months, gas and electricity are not included. Smoking tolerated, Pets allowed with a deposit for damages. The property is set in beautiful countryside, surrounded by olive-groves and outstanding views, with own parking. The 13th century farmhouse retains all the original characteristics, but provides modern amenities. Close to city centre, (12km). There is a very reasonable and efficient tramway, starting from Scandicci (6km), the closest village at the bottom of the hill. Leave your car at a free parking, close to the “Villa Costanza” tram stop (terminal), buy a ticket at the machine on tram. There is a tram every 4 minutes. The last stop is where you have to get off (20 mins) : ‘Stazione S.Maria Novella’ (next to the railway station and 5 mins walk to the Florence Cathedral ). Trams run from 6:00 am to 12:00 pm. 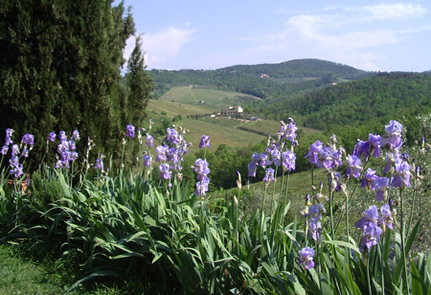 , 10 mns from motorways (Tyrrhenian Sea, 90 km ( ‘Fi-Pi-Li’ double carriage way), Siena, Arezzo, Milan/Rome A1 motorway, etc.). These cannot be seen or heard from the property. Close to large and convenient supermarkets (6km). There are several good country ‘ trattorias ’ (restaurants) in the area (5mins drive). Village shop with own bakery, open on Sundays and bank holidays, within 5 mins. drive. The English speaking owners live on the property. Other languages spoken : Italian, French & German. a) guided wine and olive-oil day tours all year round. c) visits to historical towns and spas of the region. Owners organic Extra Virgin Olive Oil, organic jams, organic chutneys, and vintage wines can be purchased.